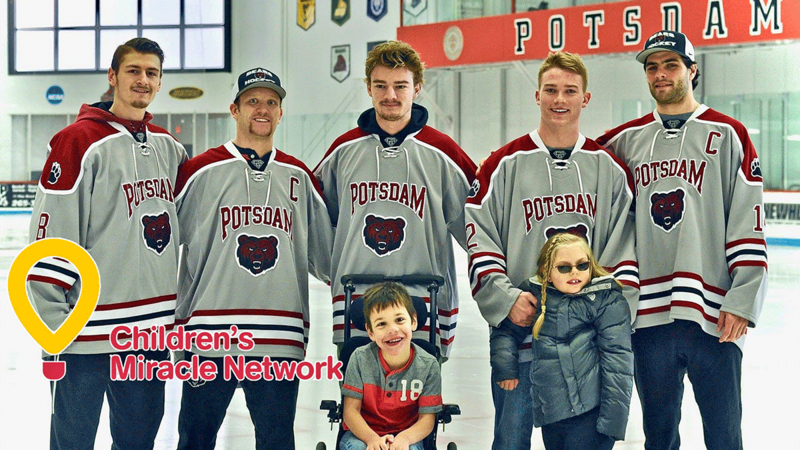 POTSDAM -- Saturday night is Children’s Miracle Network Night at the SUNY Potsdam Bears Men’s Hockey game vs. SUNY Canton’s Roos at Maxcy Ice Arena at 7 p.m.
Potsdam has teamed up with the Children's Miracle Network to support Taygen and Aiden and other North Country children facing medical crises. There will be a 50-50 chuck-a-puck, a center ice shootout for a 32" television, and a silent auction after the game to bid on Bears' gear and other items, all in support of the Children's Miracle Network. Taygen, the daughter of Jennifer Clark, and Aiden, son of SUNY Potsdam's Jennifer Hernandez, are each battling cerebral palsy and vision impairments. Taygen is also handling epilepsy. CMN has helped provide support to the two children and their families with expenses not covered by insurance. That support has included adaptive tricycles for both kids, which allow them to keep up with other children when playing. Samaritan Medical Center in Watertown has been the North Country's local Children's Miracle Network Hospital since 1990. All of the funds raised locally stay local. CMN provides financial assistance to local families with a child facing a medical emergency for travel expenses and other out-of-pocket medical costs. Samaritan pays CMN national fees and the salary for one program director to ensure that all funds donated truly do go to the kids. For more information on ways to support the CMN, contact Jennifer Hernandez at [email protected].